A C-17 Globemaster III from the 3rd Wing, Joint Base Elmendorf-Richardson takes off March 22, 2014, at Yokota Air Base, Japan. Osakabe Yasuo took this photo on March 22, 2014 from Yokota Air Base, Japan. 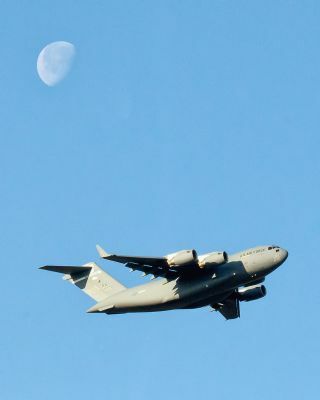 A C-17 Globemaster III aircraft from the 3rd Wing, Joint Base Elmendorf-Richardson, soars with the moon glowing faintly overhead in this landmark daytime flight in Japan. Photographer Osakabe Yasuo captured the stunning moon-and-machine snapshot on March 22 from Yokota Air Base, Japan. The flight marked the first C-17 landing at Sendai airport since the region's devastating March 11, 2011 earthquake and tsunami. Skywatchers will have the opportunity to see a total lunar eclipse during on April 15 at 3:42 a.m. EDT. The lunar eclipse coincides with the April full moon. The April full moon is known by many names including the Seed Moon, Pink Moon, Sprouting Grass Moon, Egg Moon, and Fish Moon. It will rise around sunset and set around sunrise and will be the only night in April when the moon is in the sky all night long. To see more amazing night sky photos submitted by Space.com readers, visit our astrophotography archive. Editor's note: If you have an amazing night sky photo you'd like to share for a possible story or image gallery, please contact managing editor Tariq Malik at spacephotos@space.com. Follow Space.com on Twitter @Spacedotcom. We're also on Facebook & Google+. Original article on Space.com.